I hadn’t been to a gaming convention in a year, so a quick train ride to this past weekend’s HMGS Fall In! 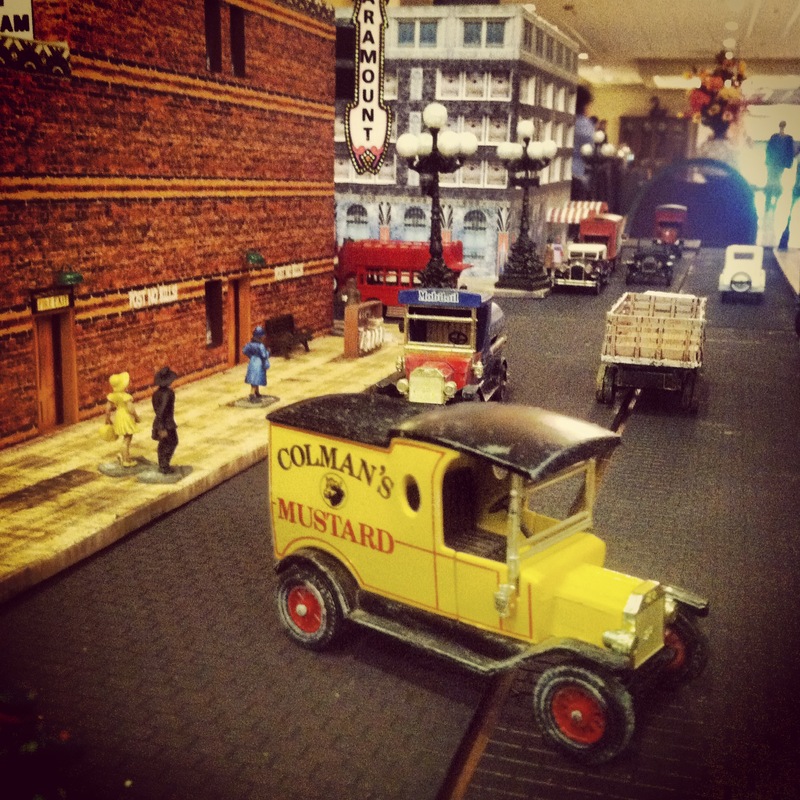 in Lancaster, Pennsylvania was a welcome getaway. 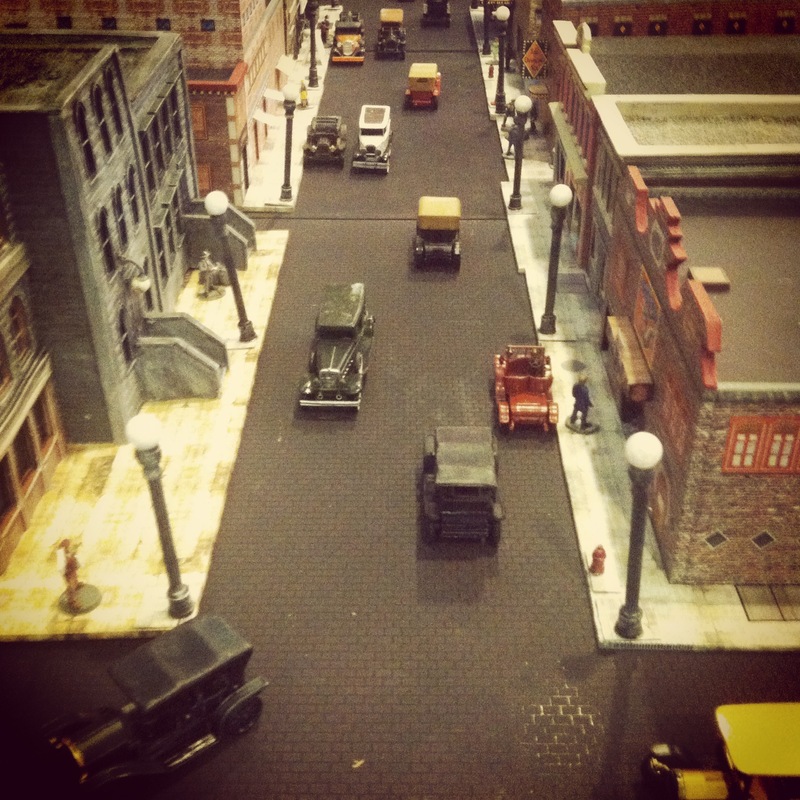 With around 2000 people participating in the weekend’s games, lectures and hobby buying opportunities, the hours logged at the convention were the usual combination of fun and exhaustion. 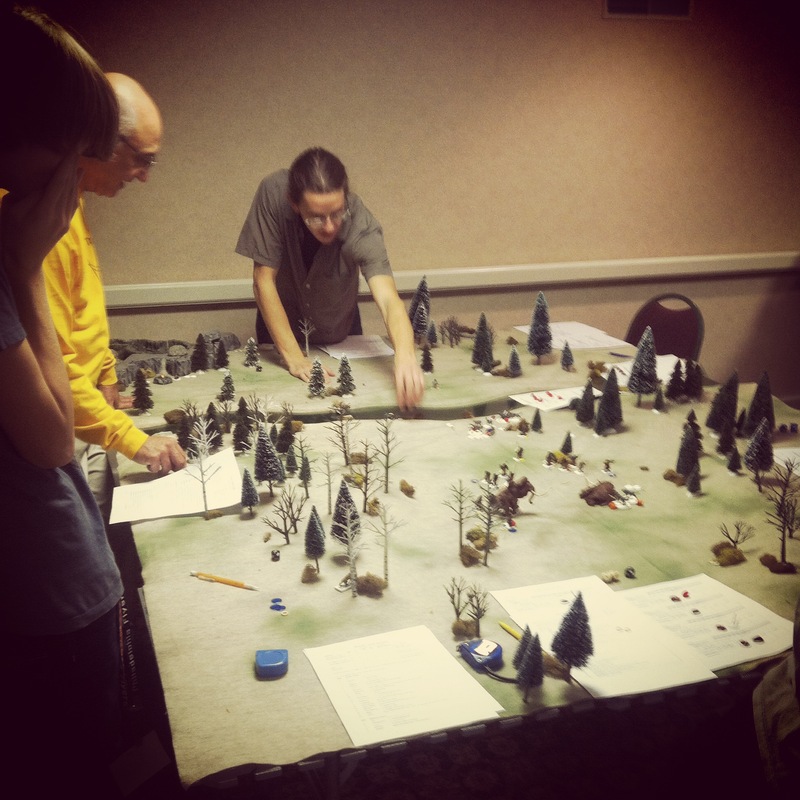 The “Home Before The Leaves Fall” convention theme paid homage to the 100th anniversary of the beginning of World War I, but their were hundreds of games covering prehistory to the future in just about every scale manageable. The weekend started for me on Friday afternoon with an American War of Independence scenario in 25mm called “Defending Washington’s Flank.” The game represented a post Battle of Brandywine engagement with American volunteers looking to hold off a further British advance toward Washington’s retreating forces. Playing as British regulars my mission was to march through the table, ostensibly to destroy a key bridge objective in the far distance. A central road stretched the length of the table flanked by two forests leading to fenced fields and farms in the distance. American colonials threatened on each side and from defending positions at the farms ahead, so the British columns chose to break into two forces to the right around one forest and at a straight march down the road. Serving as a shield, the British front column marched straight ahead in European tradition, taking heavy losses from musket and cannon fire on either side of the road. 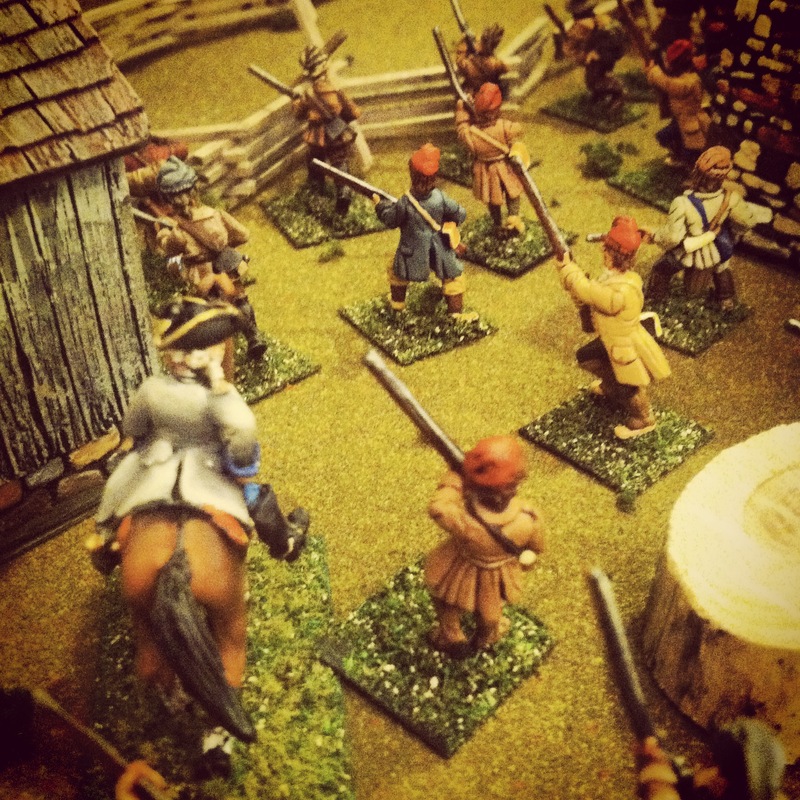 With redcoats falling on the road ahead, their countrymen were able to mass into lines to the rear, tow a fieldpiece toward the front and slip another two columns to the right around the forest. 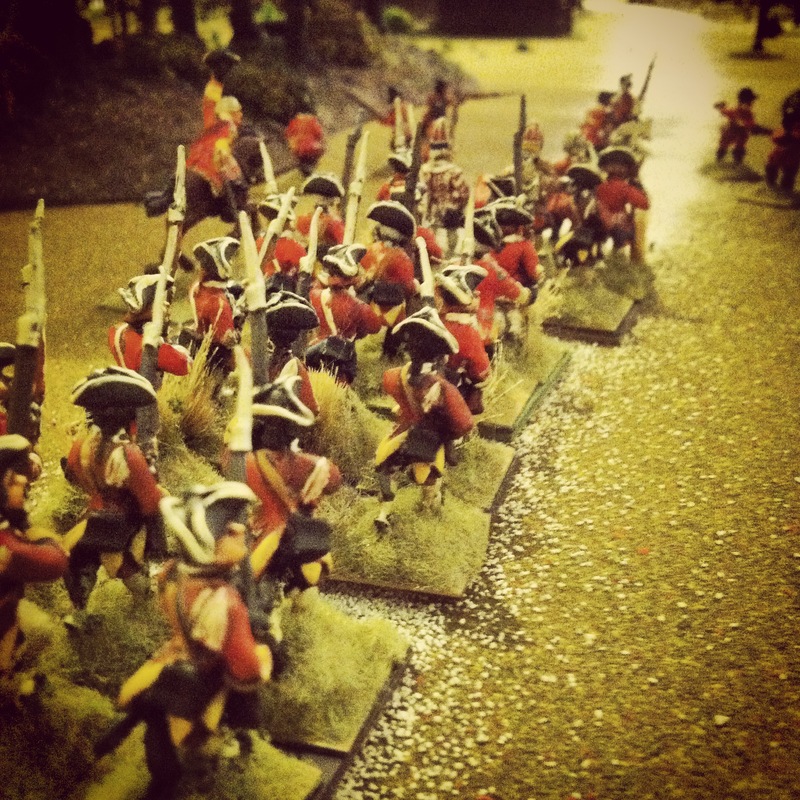 With colonials holding the British at the halfway point on the board, they had successfully halted the redcoat advance. 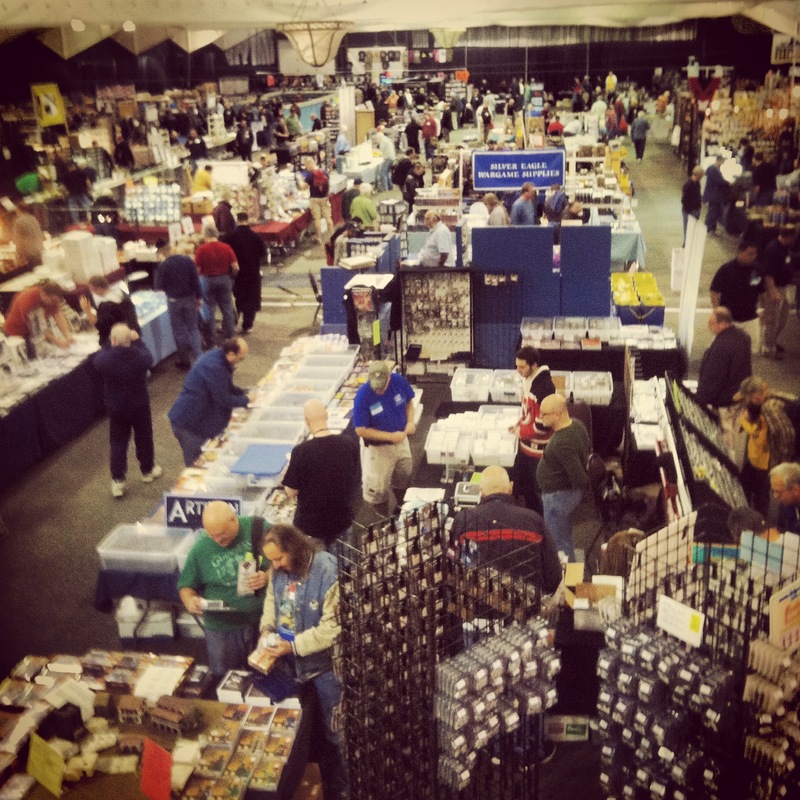 The crowded dealer hall at HMGS Fall In! I also hit the dealer’s hall Friday afternoon which seemed to be more full than the previous year’s Fall In! con. There didn’t seem to be a single “it game” but Bolt Action, Flames of War and other World War II games still seemed to dominate. I immediately scored a hardcover copy of Chris Anderson’s Seven Years War classic Crucible of War for just $30. Just down the way, another dealer was running a wildly-popular 40% off sale with guys carting away armfuls of models from Flames of War, Plastic Soldier Company, GHQ and a number of terrain suppliers. 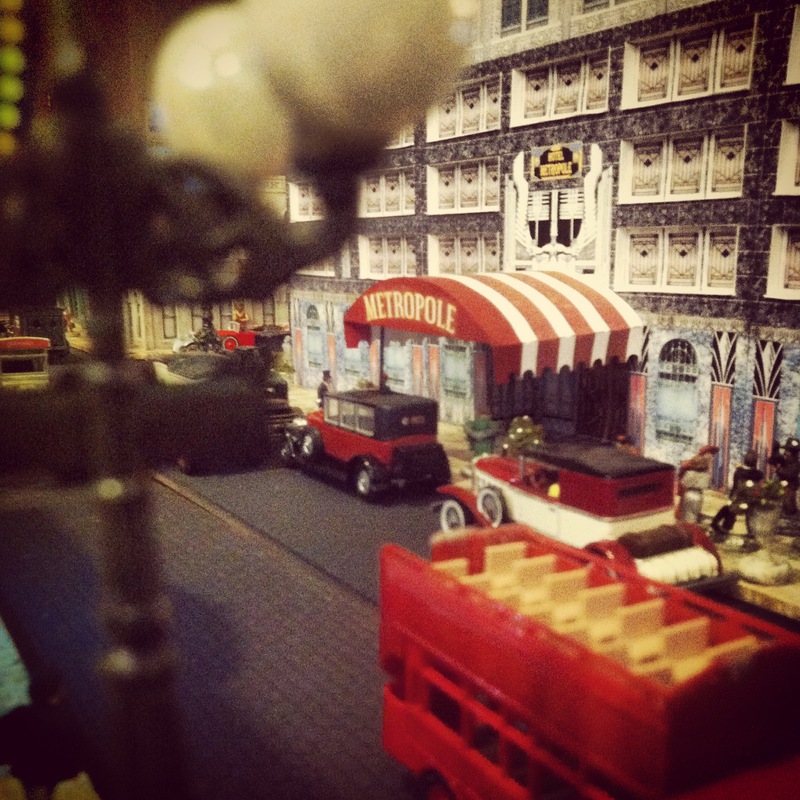 I scooped up two big 15mm European city block models from JR Miniatures to add to my growing Western European terrain collection. 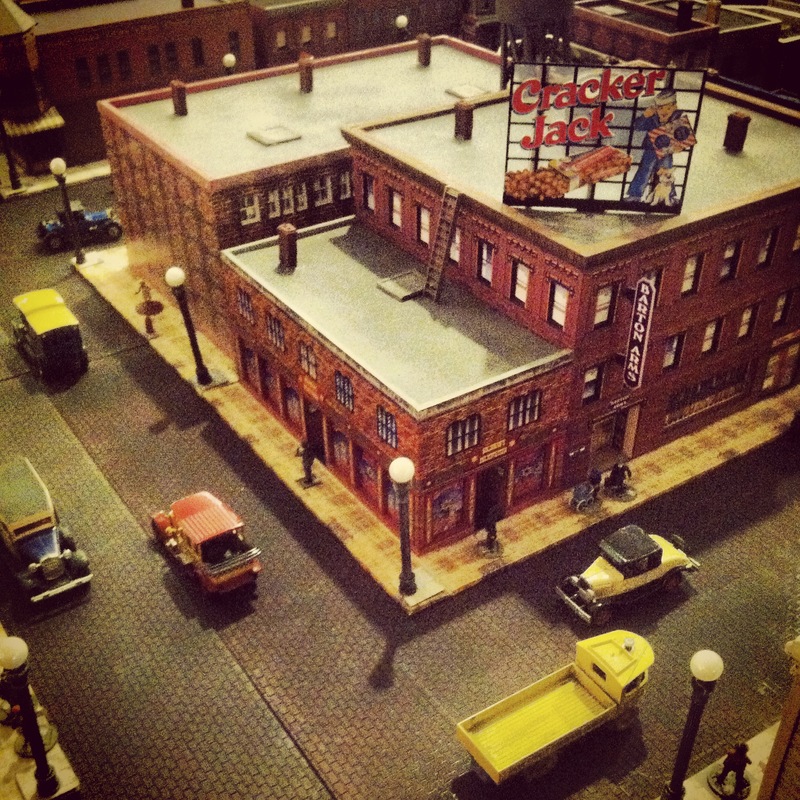 Friday night’s game was the winner of best in show with a massive Prohibition era pulp game also in 25mm. 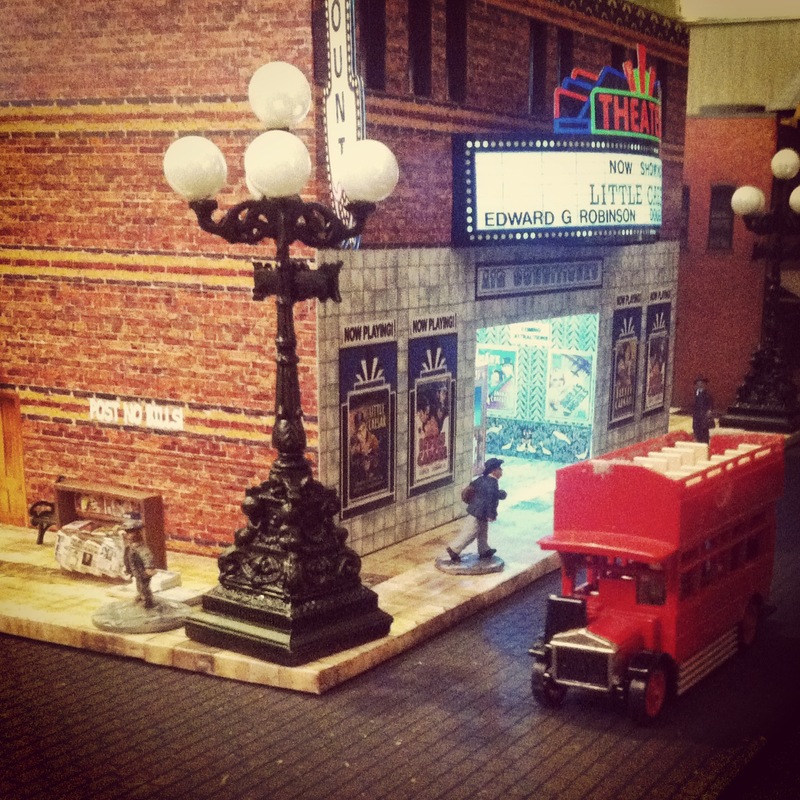 Multiple tables were set up with a fictional city scene featuring more than 100 buildings supplemented by lit interiors, working advertising signs and theater marquees, scores of cars, trucks and vans, and hundreds of player gangsters and civilian characters. As period music played in the background, competing gangs battled it out over six hours. The simple rules allowed for a pretty wide-open game that was an impressive mix of miniatures gaming and role-playing. 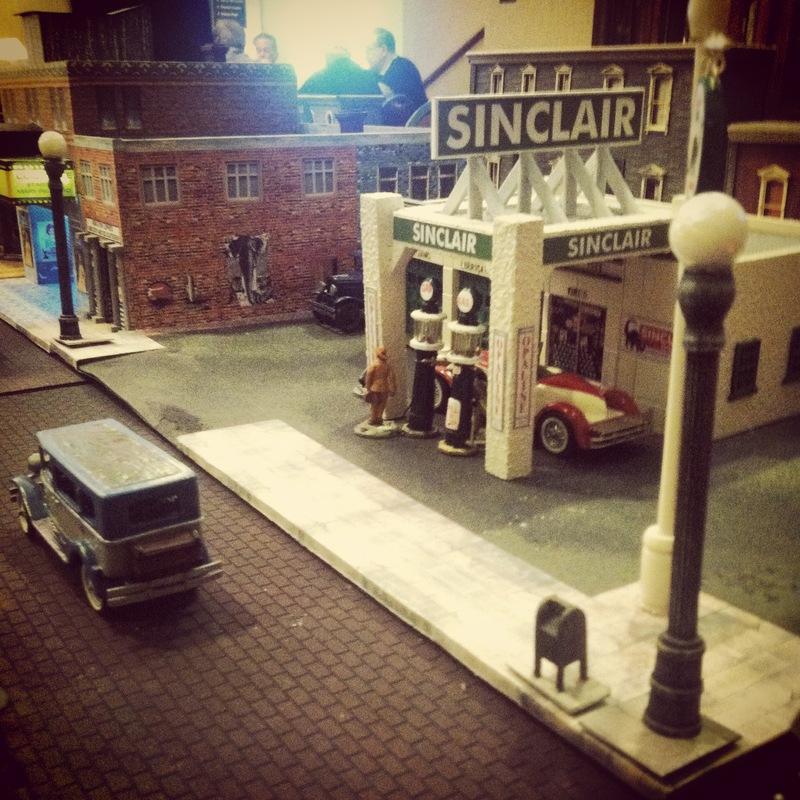 My south side gang began the game by hijacking a competitor’s delivery truck in a bloodless showdown in the middle of a bust street. From there, we drove in two directions to rob a corner savings and loan. With our vehicles parked on the curb, we drew our guns and announced a stick up. Just as we were making our escape, another gang showed up, blocked our getaway with their cars and shot down much of our gang in the street. With two crooked cops paid off by the other gang also shooting us up, our survivors were able to make it to our cars and ram our way through traffic and make it away from the scene bloodied but still hanging on. Other gangs spent the game whacking the competition, setting a warehouse on fire, gun-running and generally creating a city of mayhem of double-crossses and lead flying through the air. With probably more than 20 people playing, the game masters (who put in two years building and developing the game) did an amazing job in holding the entire game together. 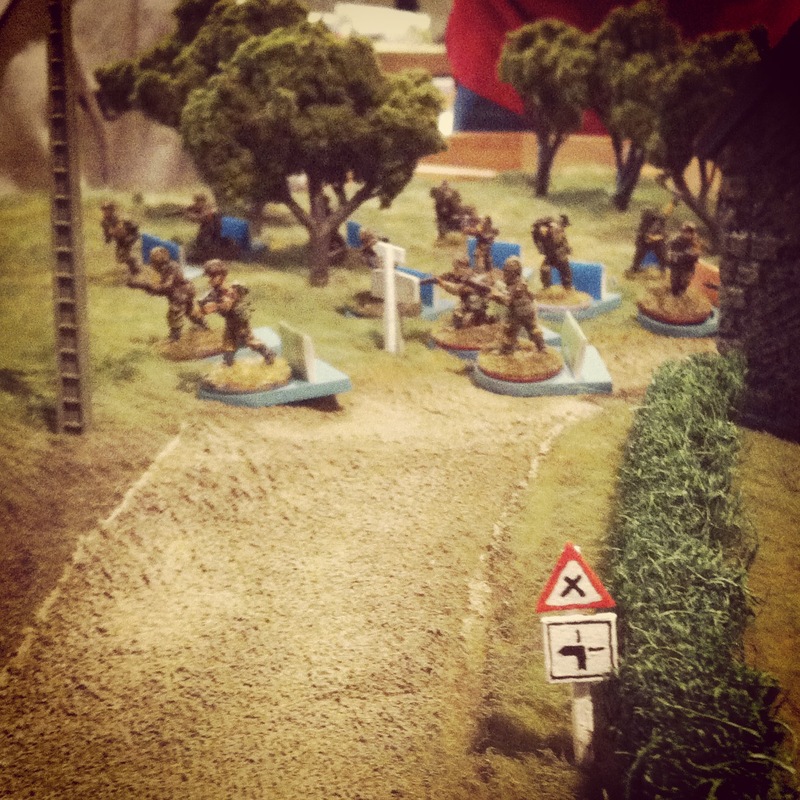 My first Saturday game was “The Bloody Gatehouse: Assault on Strongpoint Varaville,” a scenario on the morning of D-Day in 25mm using the Nuts! rule set from Two Hour Wargames. 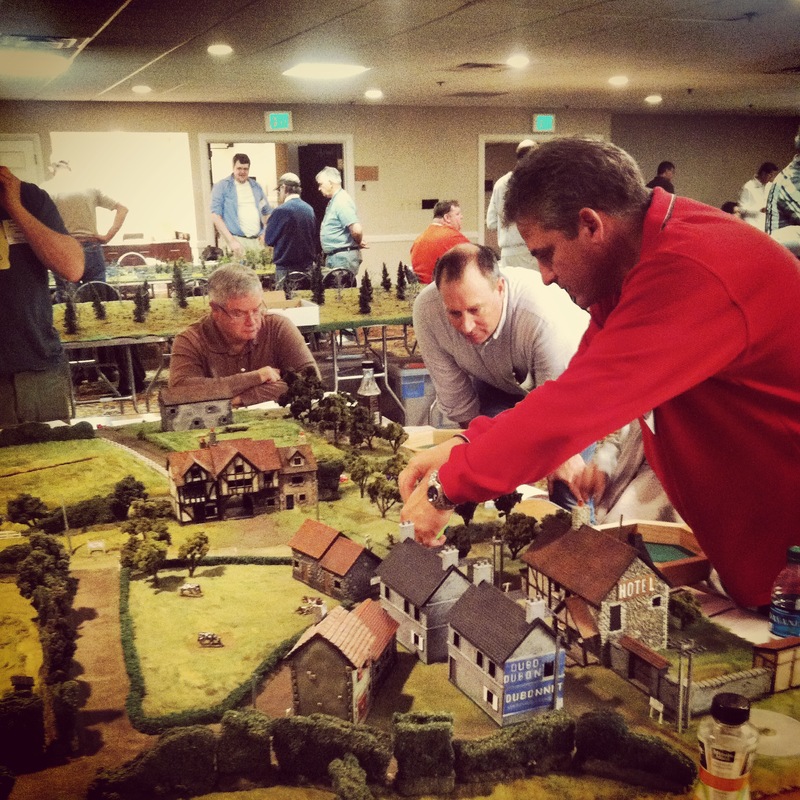 Run by John Stapleton and Steve Waddell from West Point, I had read about the game from a previous convention in Wargames Illustrated, and I was anxious to play the small action on an absolutely gorgeous table. Playing with a partner as members of the 1st Canadian Parachute Batallion, our mission was to push through the town and take control of a German-held stone building and artillery position beyond. The game progressed with my squad occupying a centrally fortified gatehouse and firing into German positions in the building and trenches across an open field of fire. Two of my rifle-armed Canadians managed to repeatedly injure, rattle, pin and kill a number of Germans, including a deadly MG42 crew as other Canadian squads crept toward a wood in a flanking maneuver to the right. My gatehouse paratroopers held the center of the table for the majority of the game, eventually taking heavy losses from HE rounds fired from the German gun. With bloody close-action combat in the woods and a vastly depleted German force in the stone building, by game’s end the Canadians had moved a Vickers machine gun and light mortar into position. Well poised to destroy the remaining German force, the day went to the Canadians. Adjacent to my table for much of Saturday was a massive Battle of Dresden 1813 scenario in 15mm. 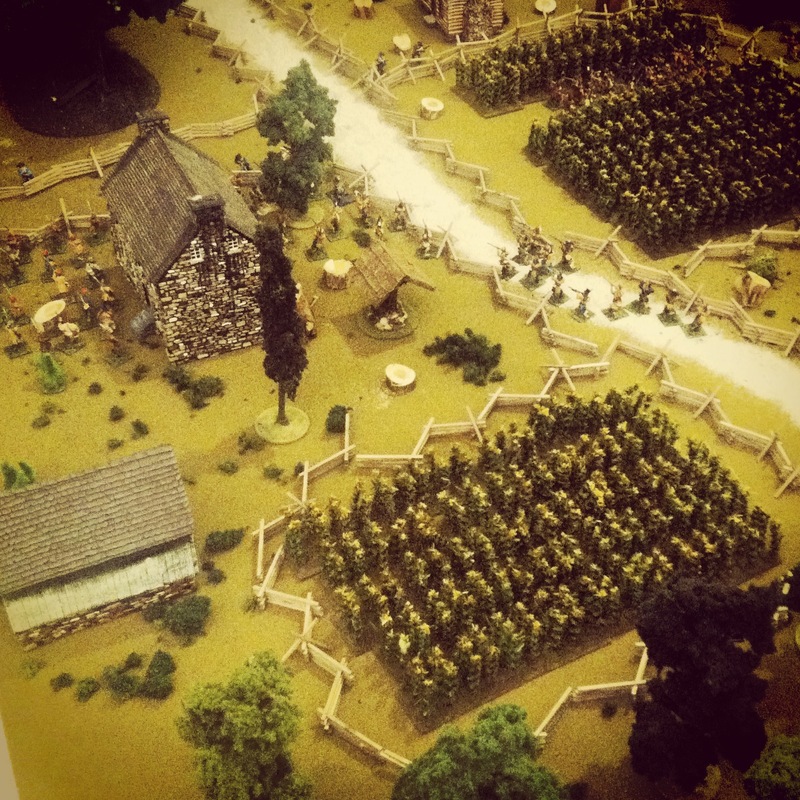 The six-hour game was one of the signature Napoleonic games at the con, as a table teeming with beautiful Austrian, Russian, Prussian and French miniatures made slow and crowded progress across the fields outside of Dresden 300 years ago. 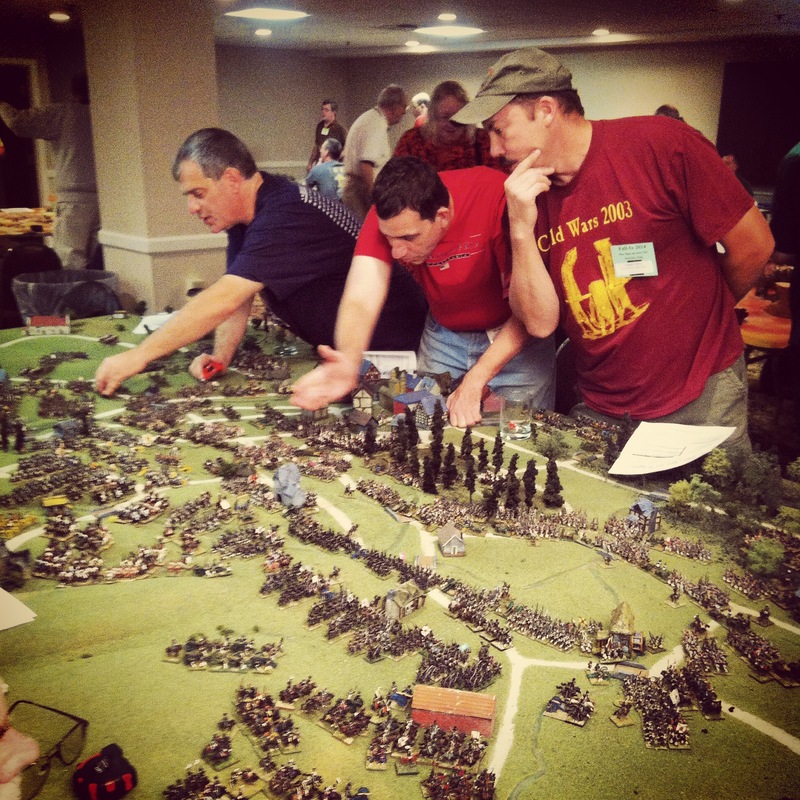 A number of veteran players in the period (including my brother in the hat above) flocked to the game for the chance to replay this award-winning game of the third largest battle of the Napoleonic wars. 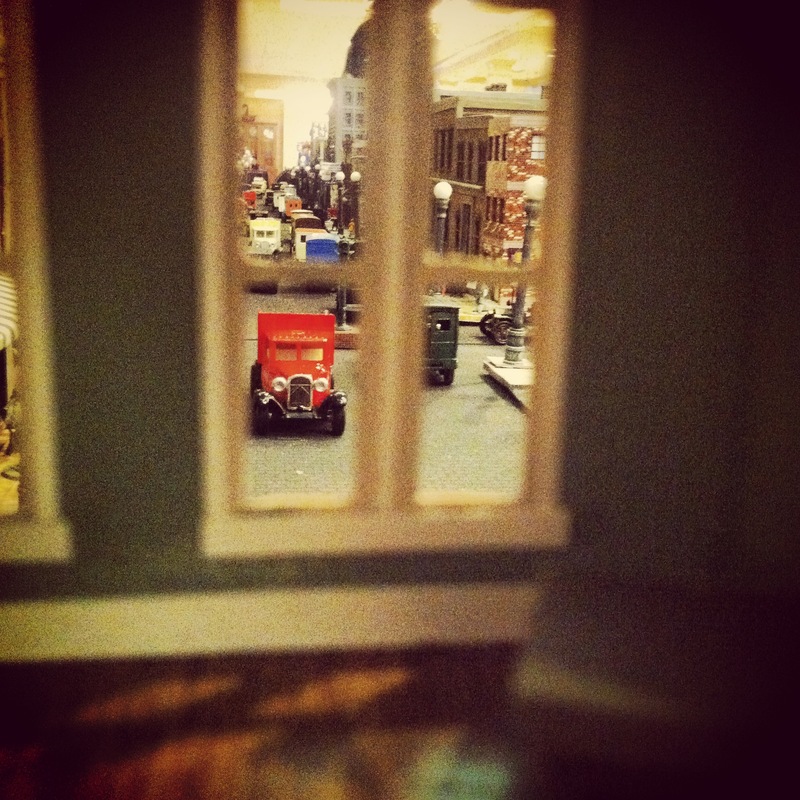 Down the hall, my nephew played in a prehistoric 28mm game called Sticks and Stones. 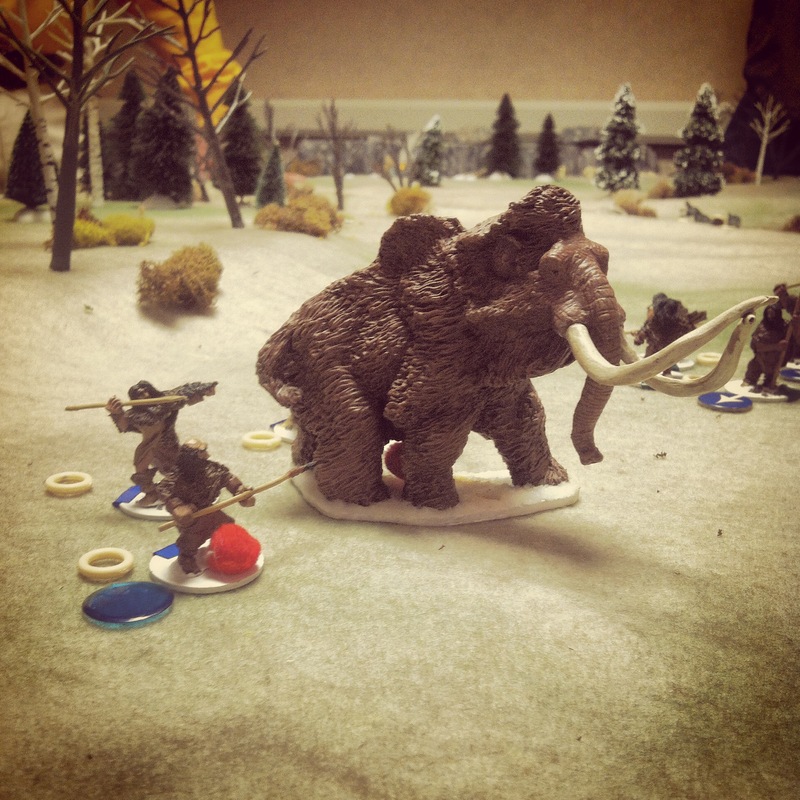 With rules developed by the young game master Andrew Hershberger using early humans, mammoths, wolves and other prehistoric creatures by Acheson Creations, the snowy game presented an early hunter/gatherer tribe’s quest for survival in an unforgiving world of danger. Talking to Andrew after the game, he’s an incredibly engaging young guy with a passion for developing his new game — just the kind of person I love to meet at a con who is willing to carry the torch of the hobby into the future. A scenario of the US Navy Seals raid and eventual killing of Osama Bin Laden at Abbottabad, Pakistan in 2012 also proved to be popular throughout the convention weekend. Run by gamemaster and author of the new book Killing Bin Laden, King Chris has been a feature at cons since 2011 with games focusing on modern US actions in the Middle East. Late Saturday afternoon I signed on for a French and Indian War skirmish scenario called “The Bloody Forest.” Played with simple house rules in 25mm, the game represented colonial farmers and irregulars looking to defend their land against an Indian and French coer du bois war party swarming through the surrounding cornfields and forests. With colonials quickly falling back to the blockhouse, our Indian and French swarmed the palisade and took heavy musket and cannon fire while attempting to breach the walls. 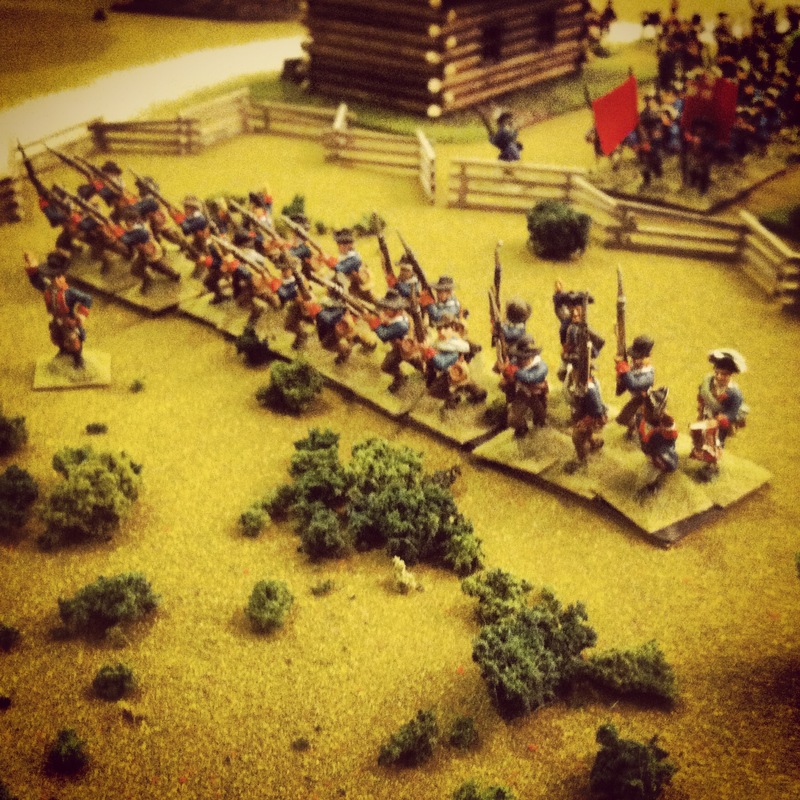 With the colonials making their last stand with their enemy attempting to kick in the blockhouse door, a British line of regulars appeared from the forest behind the French and Indians offering withering fire into the back of the raiders. 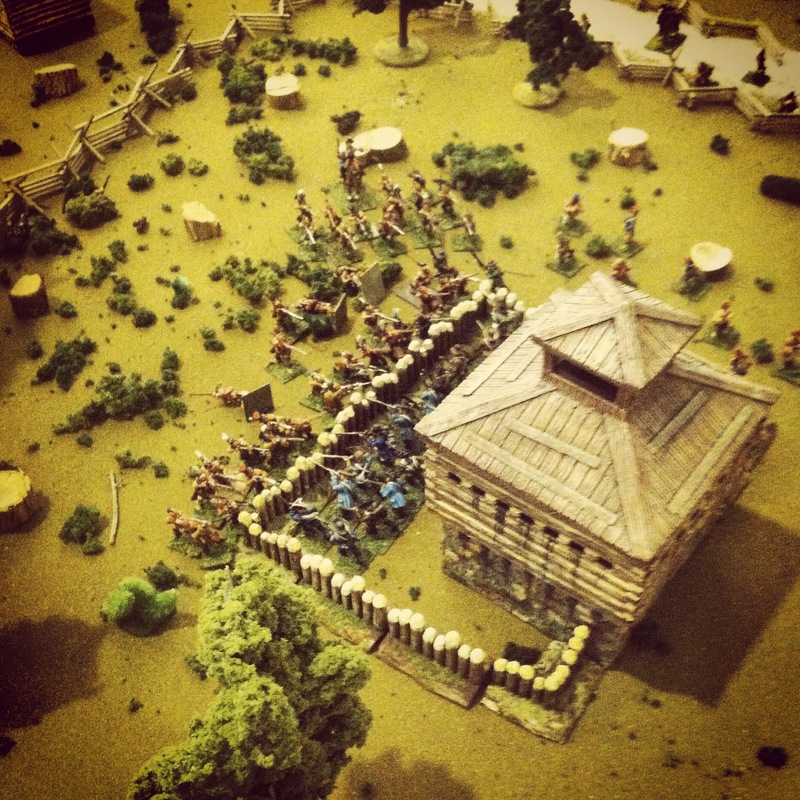 The settlement had been saved for the day after a very, very bloody battle. Kids play the holiday-themed “Save Santa VII: Halloween Horror! 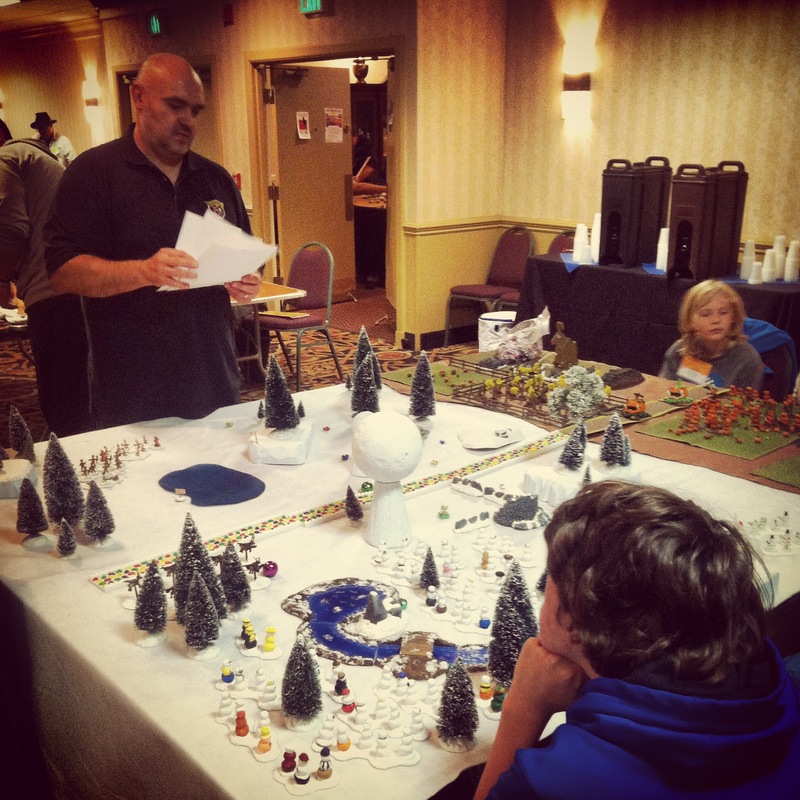 A good-sized contingent of kids and entire families were found throughout the con, but a few games were presented specifically for younger wargamers. 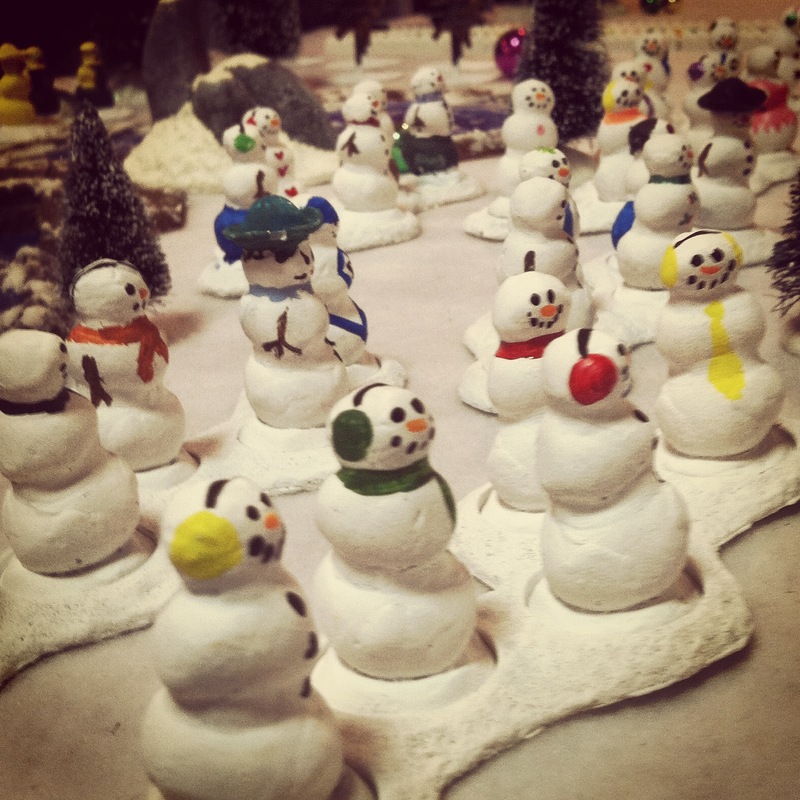 A favorite was “Save Santa VII: Halloween Horror!” by Shawn Reis with a snowman army allied with forces from the Easter Bunny looking to hold off an assault by the Halloween forces of Jack-O-Lantern and save Christmas. 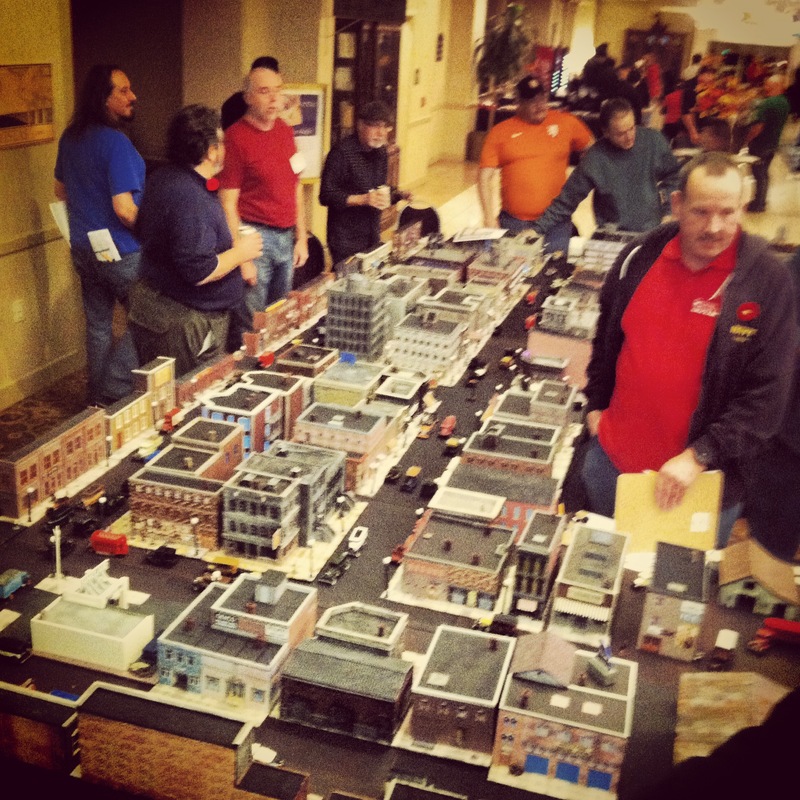 The winter and fall seasonal sides of the board traversed by a candy-paved road was filled with fantastic large-scale models in a wonderful fantasy game. 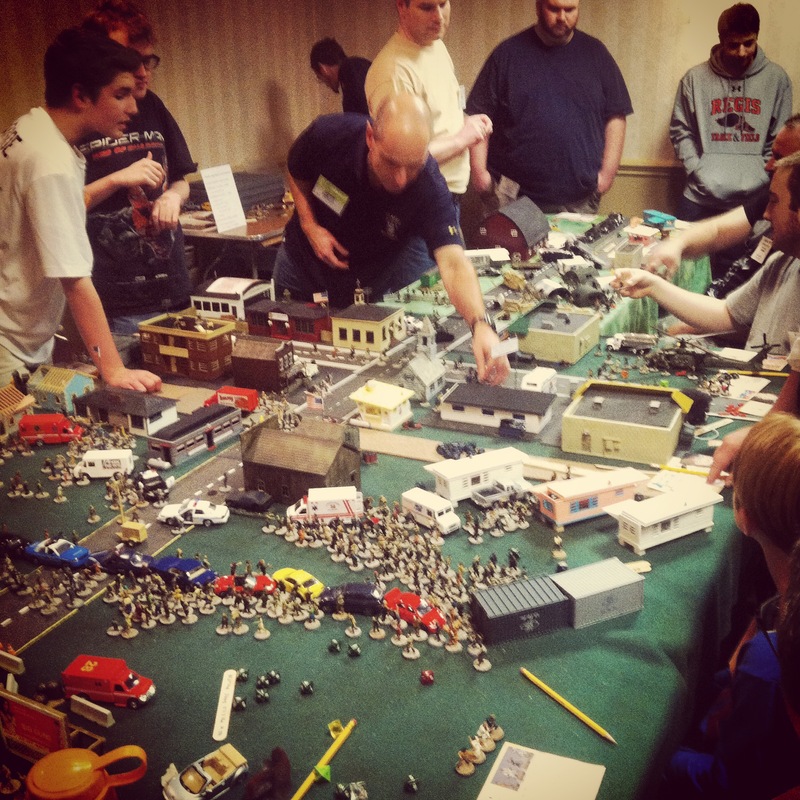 Post-apocalyptic games continue to be popular at the HMGS cons, attracting novice and veteran players of all ages to big tables filled with zombies, survivors, hand-built weapons and other mainstays of the genre. 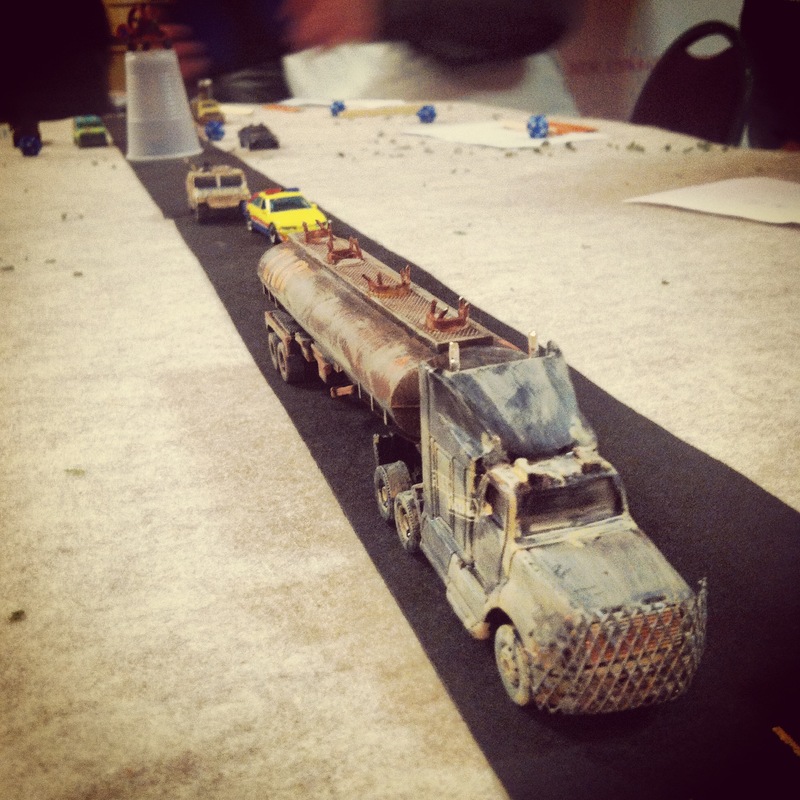 The con drew to a close for me late on Saturday night with a raucous home-brewed Road Warrior game by Eric Goodlander. 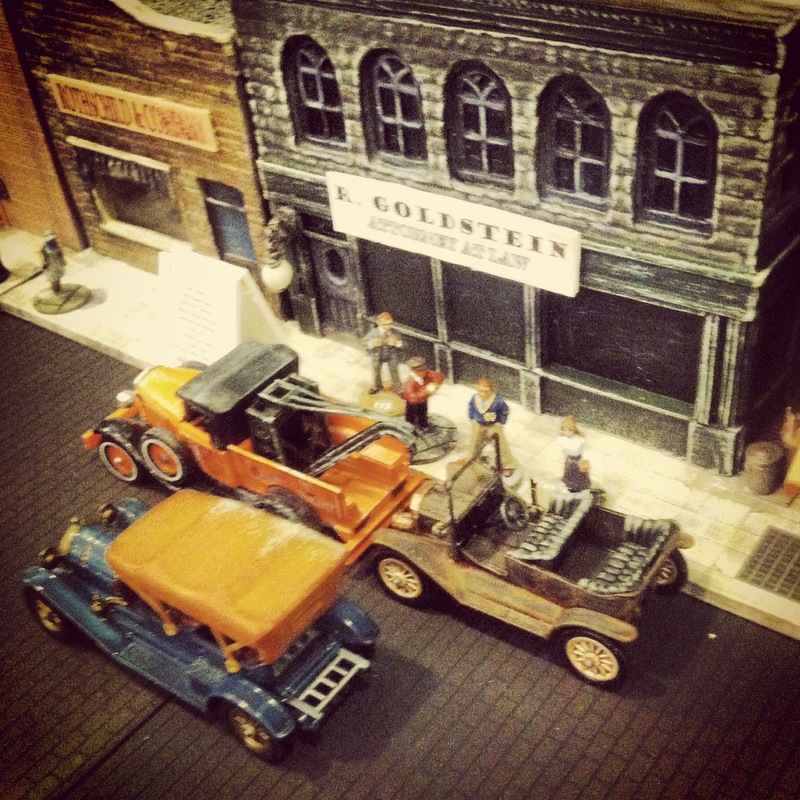 Using fantastic modified Matchbox, Hot Wheels and other small vehicle models, the game was crazed as competing factions of raced down the desert highway. With bullets flying, gas bombs tossing, cars skidding and metal crashing, my “bad guy” team eventually met the “good guys” and their oil tanker in a head-on assault and a win for the forces of evil. HMGS Fall In! for me is a chance to try new games, get fresh ideas for my gaming back home in Brooklyn and meet up with guys I’ve crossed paths with and come to know a bit over the years. From muskets to molotov cocktails, my con experience stretched across a wide swath of gaming that keeps me coming back to the tables every year. When and where is this located? And for 2015, when and where is the next convention?? 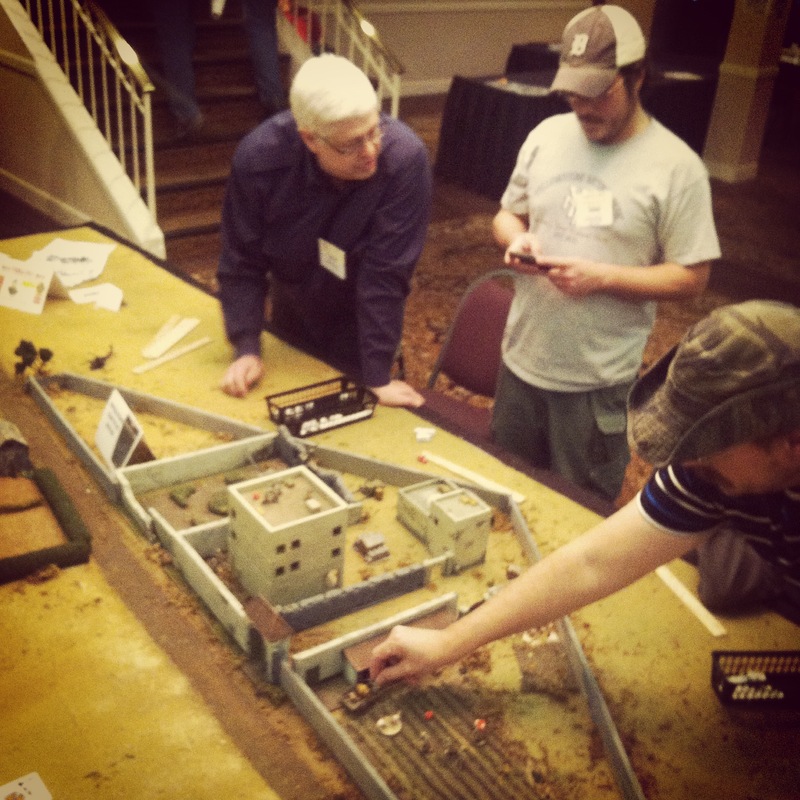 HMGS runs three conventions — Cold Wars, Historicon and Fall In — with info on all on their website: https://hmgs.site-ym.com.